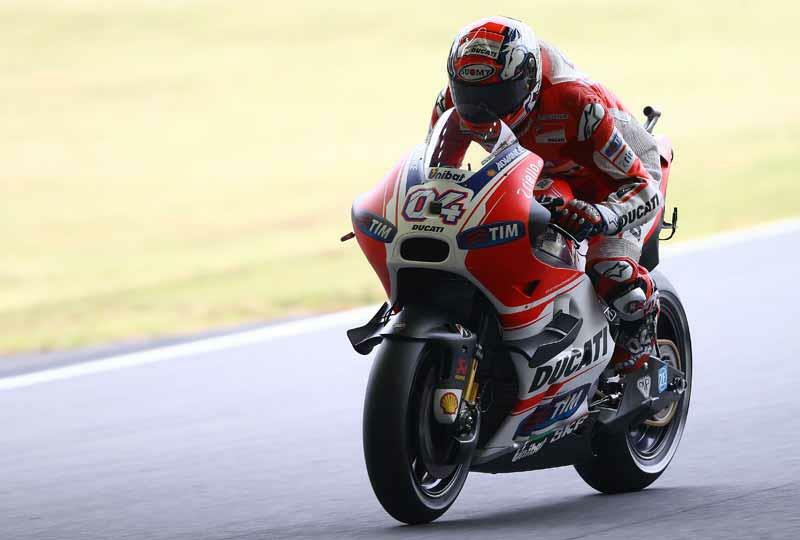 Braking stability is still an issue for Ducati at Motegi but both Andrea Dovizioso and Andrea Iannone felt that the team has made progress with the issue and were both pleased with their qualifying performances. The Ducati riders will line-up on the second row of the grid and while they were unable to challenge the Yamaha's in qualifying both felt that there were plenty of positives to take from qualifying at Motegi. "I'm happy with our weekend so far because I've got a better feeling on the bike and we've improved the braking stability," said the Italian. "The bike is strong on acceleration and it's fast on the straights. The feeling that I have with the bike means that I still need to improve the braking stability for my riding style. There is no weight on the rear so we have to put all of our pressure on the front brake. "Our pace isn't quite as good as Lorenzo and there's four or five riders with a similar laptime and everything can happen and we're there to fight. The new winglets look big but the effect of them isn't that big. I didn't feel any negative points about them and if you don't feel anything negative when you are turning then it's a positive for you and you'll continue to use them." For Iannone his injured shoulder is still causing him plenty of concern and with so many physical heavy braking zones at the Japanese circuit he expects the race to be a challenge for him. Riding without painkillers today the Italian was pleased with fifth fastest but he'll numb his shoulder tomorrow before the race but in the closing stages he knows that he'll feel the effects of the injury. "After yesterday I have more pain in my shoulder and it's really difficult for that injury here because of all the heavy braking areas. I didn't use painkillers today but I'll use them tomorrow and I'll try my best in the race. I'm focused on pushing really strong and riding to my maximum in the early laps. When I think of the shoulder it becomes a difficult situation for me and in the last part of the race, for sure, it becomes more difficult for me than it is for other riders but I see this and I try my best in the race. In the dry or wet the pain is the same but I prefer the dry because in the wet the situation is different than the dry conditions and it's always better to fight in the dry." Braking stability was a major issue for Iannone on Friday and while the made a step in the right direction today the former 125cc and Moto2 winner at Motegi will try some setup changes in morning warmup to improve rear grip. "We have improved the bike in the braking point and turning but we haven't improved the rear grip. I tried a different setting to help the rear grip but it didn't work so I have one solution to try for that in tomorrow's warmup but that's the last option for us and I hope it'll help the problem. This morning the track was a bit better and with the lower temperature in qualifying the grip was a bit less and this didn't help me."